I wrote the other day about a great quote about realizing that only a few things are essential in life. As I have been pondering this quote, it got me thinking that to truly put this quote into action, I needed to write these things down. So I created a page titled “What is Essential?” I then created a few categories to put things into that I do and set out about writing down the things that take my time in these spaces. As I wrote, I realized I really needed a page for what is important and a page for what is good as well. This way I can put down everything I am doing into one of these categories. Brayden asked if I was going to make a page on what was no good and I told him no–if it doesn’t make any of my lists, I probably just don’t have time for it. If I feel like I need time for it, then it should be on one of these three pages at the minimum. I have been filling in my pages. My plan is once I have my daily activities filled in, I will then look at my pages and plan my days. I will make sure there is time for what is essential. Once I am sure I have adequate time to accomplish the essential each day, I will add in important things. If there is time after the important is done, I will fill in with the good. These things don’t have to all be tasks or things that take great effort. I do think that it is important to take time to rejuvenate and take time to have fun with those you love. Let me explain my categories a bit. I made a list of categories I think are essential in life. I then studied my chart of Maslow’s hierarchy of needs and compared what I had down to the things accepted as needs in general. Lord/Service: This category is pretty self-explanatory. This would be things like prayer, scripture study, service toward others, church work, etc. If you are not religious, you can still use this section to make note of the service things you do each day. Health: Health is a basic need section. This would be things like food, water, sleep, hygiene, cleanliness of home, exercise, etc. 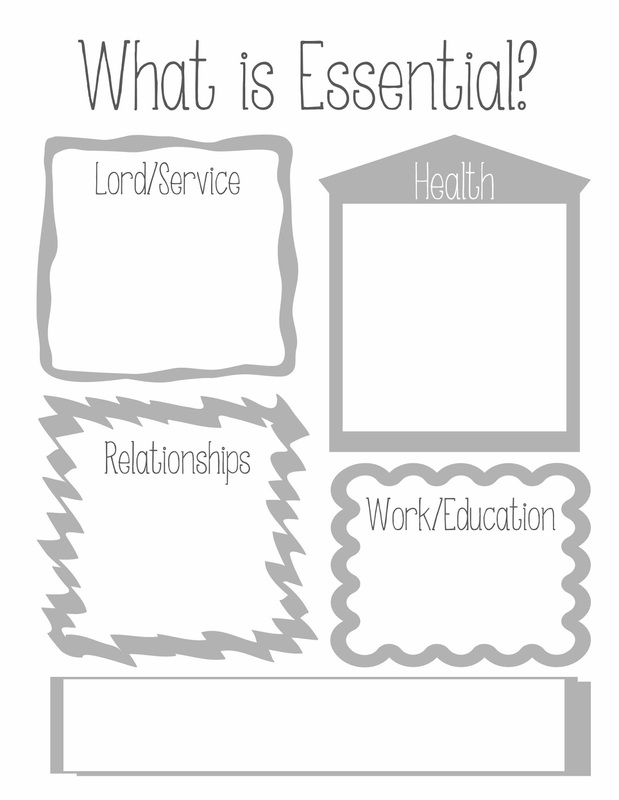 Relationships: Here you will put things pertaining to the relationships you have in life. This may include spouse, children, parents, siblings, family, friends, neighbors, etc. Work/Education: There are things that you must attend to in these categories so they are here. You might be educating your children through homeschool. Your children might have homework. You might have work goals you need to attend to. 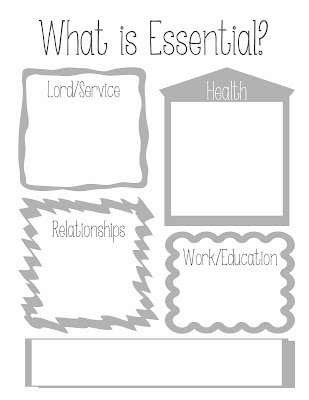 Blank: I left the bottom section blank for you to add anything you feel like must be there. You all will have a variety of things that will need to be attended to by you on various levels (from essential to good). Think about security issues (savings, food storage, emergency preparedness, home safety, etc), goals you have set for yourself in life, creative outlets you have, hobbies, and more. I won’t presume to tell you what should go on the essential page, what should go on the important page, and what should go on good. That is for you to prayerfully contemplate and decide. 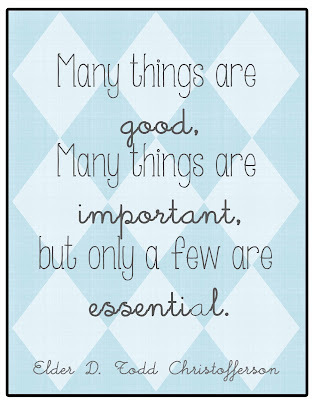 I think “essential” in many cases will vary among people (though there are some I would consider essential to all). I will suggest that there should be things in each category that really are essential. Here are some bitmap images of the 3 files. If you click on them, it will open them in a new window and you should be able to print them from there. If that doesn’t work out, I have also uploaded PDF files on my Google Drive. Getting Stuff Done–Stop Fighting Yourself!